The old adage “there are plenty of fish in the sea” is no longer true. Seafood stocks are under increased pressure worldwide to provide for growing populations. This increased demand has taken a toll on fish populations and the health of the oceans. Two-thirds of the world’s fishing areas are considered over-fished. And the frenzy to keep up with the demand from consumers produces a stunning 30 million tons a year of wasted catch – animals caught accidentally and discarded for dead. This “by-catch” not only includes sharks and other fish but also turtles, sea birds and marine mammals as well. Efforts are being made to change the destructive fishing methods that damage habitats and produce tons of “by-catch. " Aquaculture or “fish farming” is providing some relief to the demands on fisheries. Sustainable seafood is becoming an increasingly important part of the formula for healthy oceans. Sustainable seafood is shellfish and fish caught or farmed in environmentally responsible ways. That means the methods used to grow or collect the fish did not impair the health and productivity of the ocean’s ecosystem. Many people assume that any fish that is farm-raised is “good” or sustainable -- and that is not the case. Typical methods of farming fish have harmful impacts on fish populations and the environment. Open-ocean net pens are sources of pollution from waste and excess feed, and can allow the spread of disease and parasites to wild fish populations. Genetically altered and non-native escapees from fish farms pose a different set of problems! Conservation groups have developed public awareness campaigns to help inform us about the issues involved with keeping the oceans healthy. Seafood Watch is a program developed by The Monterey Bay Aquarium to educate consumers about sustainable seafood. They publish a regional pocket guide for consumers with common seafoods listed as “Best Choices,” “Good Alternatives” and “Avoid,” depending on the current status of the species. Click here for a current Seafood Watch pocket guide for the Northeast. 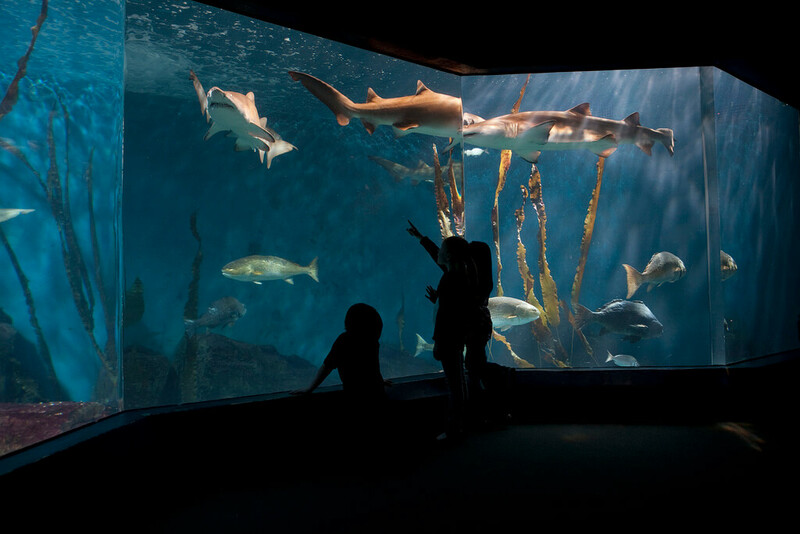 During your visit to The Maritime Aquarium, explore the issue of sustainable seafood by stopping at the Sustainable Seafood Cafe (near the entrance to "Dragons"/"Meerkats"). A selection of amusing but informative videos – produced by Monterey Bay Aquarium for Seafood Watch – will give you consumer guidance to help support healthy fish populations and smart fishing methods. Copies of the Seafood Watch pocket guides also are available. Carry your pocket guide with you and use it as you shop at your seafood market or when you dine out. Ask questions about the available seafood selections. There is a direct link between the seafood we eat and the health of the ocean. The Maritime Aquarium proudly partners with Seafood Watch in advocating sustainable seafood. Click on Seafood Watch to explore their website and take some steps to be part of the solution.